Due to unforeseen circumstances, this event has been canceled. The Richardson Maritime Museum will welcome schooners and other historic vessels on October 21 through 23 for the 12th Annual Cambridge Schooner Rendezvous. While they’re docked at Long Wharf, the ships will put out their gangplanks and invite the public aboard for tours and day sails. Various historic ships, including schooners, skipjacks and tall ships, will sail into Cambridge for the Schooner Rendezvous. Vessels begin arriving on Thursday, October 19. The Nathan of Dorchester and others will conduct an educational program for local youth and students from Dorchester County; the vessel will be their classroom. On Saturday and Sunday, day sails and dockside tours take place from 10 a.m. until 5 p.m., along with live entertainment, food, vendors, family-friendly activities, walking tours of Cambridge’s historic High Street and the Vigilant Crew encampment. 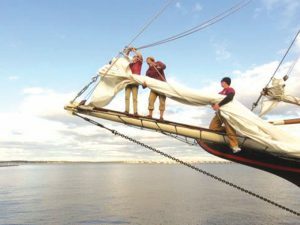 The Vigilant Crew is a living history group focused on naval history during the 17th and 18th century. The reenactors conduct their activity in the first person, which entertains and educates all that enter the camp. Saturday evening, from 6 to 8 p.m., there will be an Old-Fashioned Crab Feast under the tent at Long Wharf. Tickets are $35 for adults and $10 for children. Tickets need to be purchased in advance. 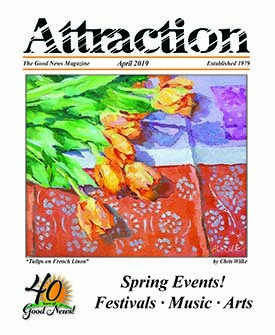 Visit www.richardsonmuseum.org for tickets. Schooners, skipjacks, tall ships and other historic vessels played an important role in the history of Cambridge; many even being built in Cambridge. Schooner trade between Cambridge, Chile and Cuba was fairly common in the late 19th and early 20th centuries – before the construction of the Panama Canal – bringing fertilizer, pineapples, sugar cane and other perishables to the region while exporting lumber and other goods. Cambridge harbor remained a viable shipping port well into the 20th century. Cambridge is the state’s second deepest harbor after Baltimore and is an ideal location for the Cambridge Schooner Rendezvous, which honors the past lifestyles and traditions of these vessels that, not only worked the Bay and its tributaries, but engaged in distant trade. The action takes place on the banks of the Choptank River at Long Wharf Park, near the intersection of High and Water streets in Cambridge. There’s plenty of free parking and the shops and restaurants of historic downtown Cambridge are a short walk away. A complimentary taxi will be operating between the Hyatt Regency Chesapeake Bay and the event. Admission to the Rendezvous is free; each ship sets admission prices for tours and sails. 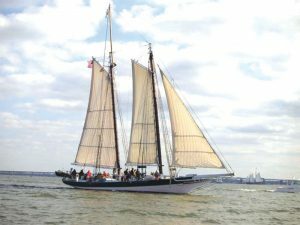 For more information, contact 410-221-1871 or visit www.cambridgeschoonerrendezvous.com.